Happy Monday! 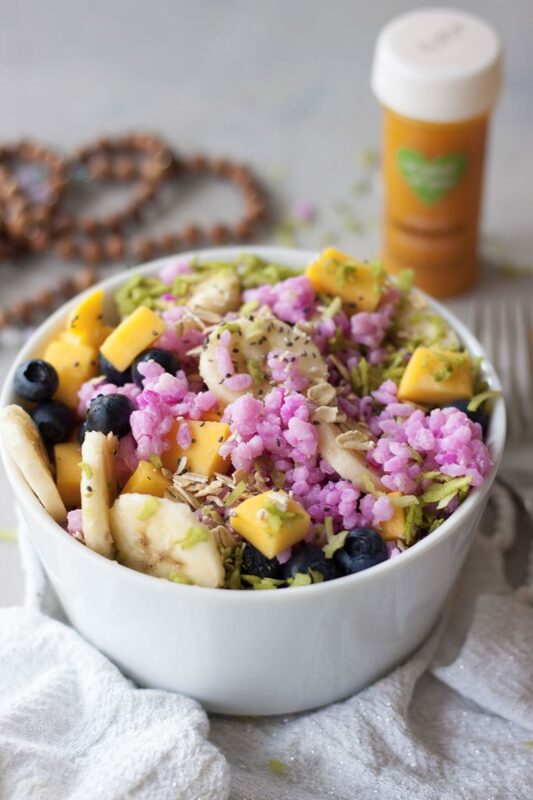 The sun will come out tomorrow, and this Rainbow Rice Bowl is a great way to start the day. You may have noticed I haven’t posted since last Monday or may have seen on Instagram that we had a family medical emergency come up. Everything is fine, my husband is resting up and recovering at home after having surgery so my focus has been on the family. I’m hoping to get back to regular posting this week as I have a lot to share but I am still physically and emotionally drained from that and other things that came up/happened last week. I’m trying to have a positive outlook and perspective and keep up with this weeks schedule as much as possible. I had hoped to share this Rainbow Rice Bowl last week but it’s fitting for today being a new start to the week and hopefully thing getting better, they can only get better, right? While this rice bowl might look complicated it really isn’t. It’s a great way to use up leftover rice or batch cooked rice and can be made with any kind of rice, in this case we had some leftover sushi rice. The rest of the bowl comes together in minutes and is very flexible using what you have on hand. While you can use plain rice with coconut milk I like adding a little pitaya to add a pink hue and make me smile. If you don’t have pitaya you can omit it but it is available in the frozen fruit section of many grocery stores if you want to give it a try. 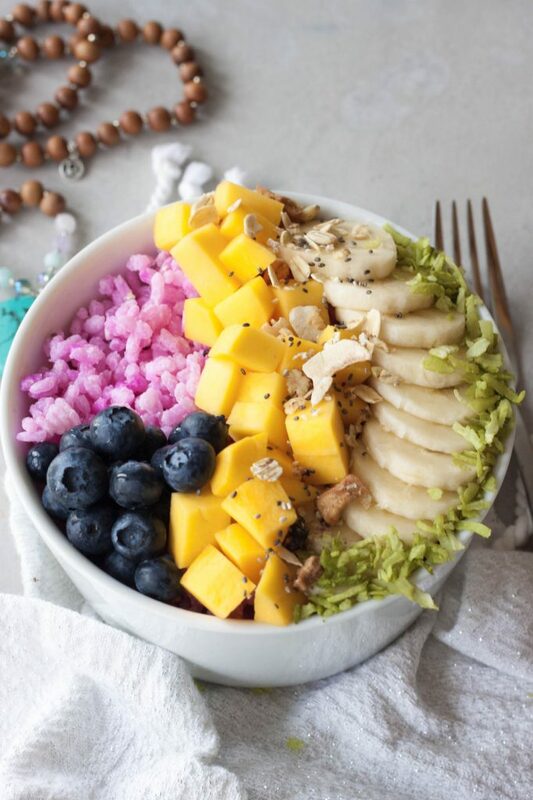 Topping pink pitaya coconut rice with fresh mango, blueberries, bananas, chia seeds, muesli or granola, and coconut. 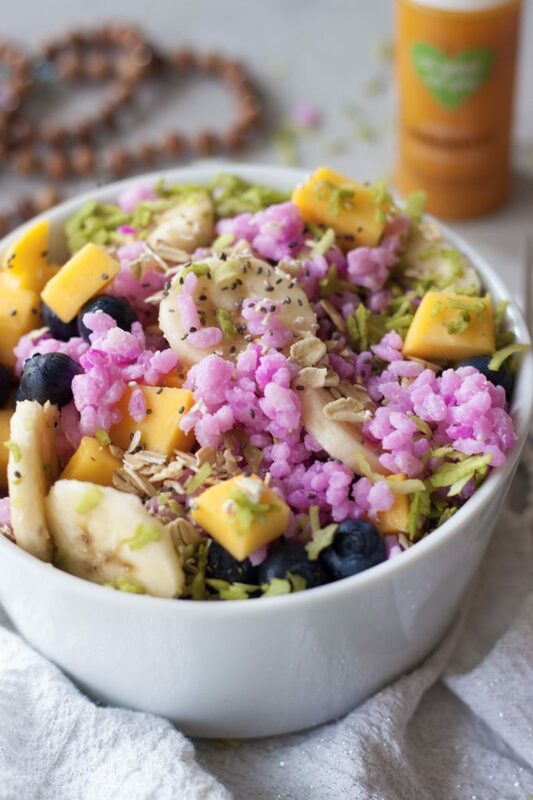 Again wanting to add color and fun I tossed unsweetened shredded coconut with a little matcha powder to add some green and a little boost to my bowl. 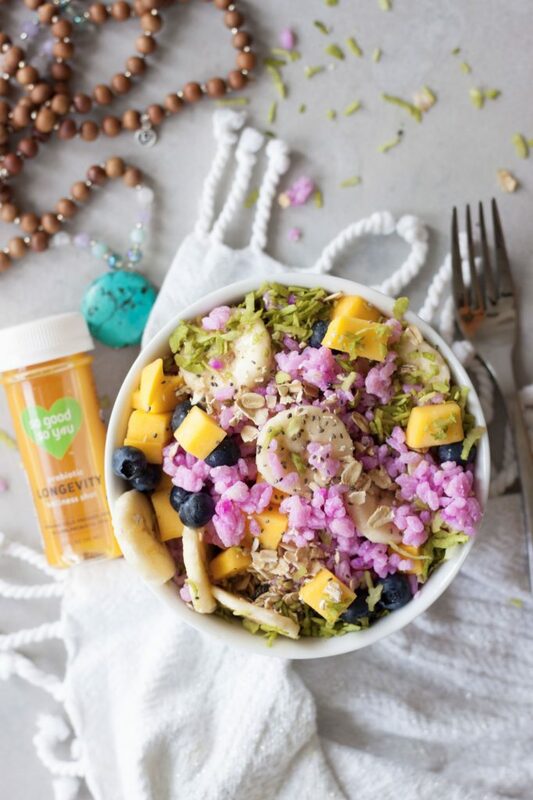 Enjoyed with warm rice or cold this bowl fills you up and really hits the spot, is packed with whole food nutrition, and the bonus bright colors to make you smile and start the day right! I share recipes like this in hopes of inspiring you, again I love to see when you make my creations or are inspired and make a version with what you like and have on hand and share them with me. 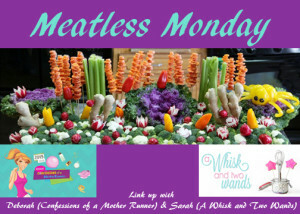 I hope you are also inspired by one of the many linked up in our Meatless Monday link below. My co-host Deborah and I would love to see what you’re making so please link up or comment below! 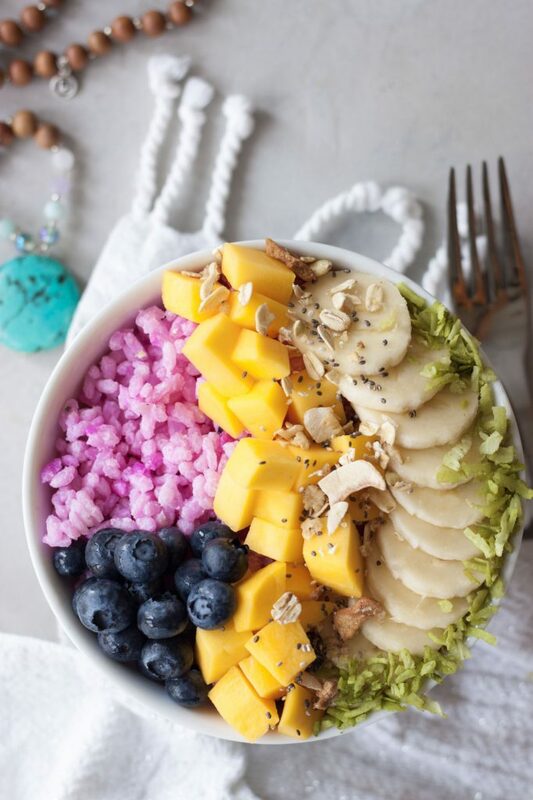 Color and flavor packed Rainbow Rice Bowl fills you up and fuels your morning. Great use for leftover rice it can be enjoyed warm or cold and is gluten free and vegan friendly. You can make this with warm or cold cooked rice. Mix rice, coconut cream/milk, pitaya, and optional sweetener. Top with chopped mango, blueberries, banana slices, chia seeds, coconut, and optional muesli. I”m glad you husband is back home. This bowl looks amazing. Take your time to come back! Family first! This is SO pretty! What a delicious bowl to enjoy for breakfast! Sure do hope your husband’s recovery at home is going well! I’m in love with this! It’s so beautiful and creative. You’ve definitely inspired me to try a rice bowl for breakfast. Thanks so much! It’s so pretty! Makes me want to fly to island asap! I am in love with everything in this bowl along with the colors! I want to dive into it now! Thanks to some recipe contest testing, I now have pitaya in the freezer! I can so make this stunning rice bowl. Alisa Fleming recently posted…Fruity White Chocolate-Covered Snack Bites: Vegan & School Safe! Wow so fun! Would have never thought to use pitaya to make pink rice! I bet this bowl tastes awesome too.